The First Day of Greenness | At The Green House. . . Happy New Year! Happy Earth Day (Every Day!) Happy 2019. . . and welcome back to At the Green House! It’s also The First Day Of Greenness. What does that mean? It means something different to each of us- and that’s the best answer. 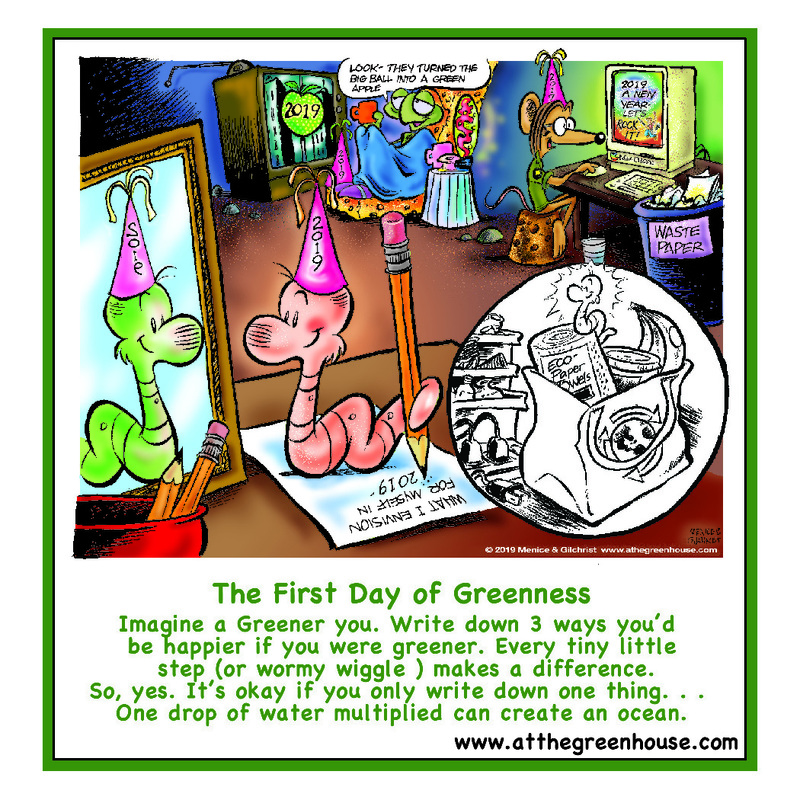 . . but for today, I’d love it if you’d take a few minutes (like Wormy is in this picture), to look at yourself, your present life situation, and set some goals for getting greener this year. Your First Day of Greenness. Now, this brings up another huge question. . . What is getting “greener?” Well, “green” is currently a trendy catch phrase for a lot of wonderful things (and I’m so glad it is!). . . healthier eating, healthier living, getting back to nature. . . Fortunately, in 2019, there is a growing focus on green issues- and bringing environmental issues to the daily public consciousness is a huge thing. Peter and I started talking about “green things” back in 2006 with “The Green House”- but the publishing world wasn’t ready for us back then (quote: “you guys are probably ahead of your time with this material”). . . more on this in a bit. . . But getting green for me started back in 1980, meeting Jim Henson and working on The Muppets Comic Strip with him. He got me thinking about the environment, our place in it, being conscious of the world as a whole and as people as “one.” He let a frog be his main spokesman and I helped write words for that wonderful green voice for 6 years. Jim taught me that accepting a role as a comic strip writer meant being responsible for a little space in each person’s morning newspaper and making someone smile during that 5 seconds they spend seeing what you’ve put there for them. I’ll blog more on Jim later this month, but for now it’s my 5 seconds. . . let’s make that 5 minutes . . . to share something with you- and right now it’s about YOU. What’s going to make you feel greener this year? What’s going to simplify your life, connect you to the earth you were born from? What’s going to bring you back to nature and bring out the greener nature of you? Well. . . . let’s start with 12 days of Greenness. First day, write down some green goals. You may not think you have many, but you will. Maybe the first is “define Greenness for myself.” Try that. Maybe you’re already a “Greenie” and want to improve on one thing? . . . That’s cool, too! On the Second Day of Greenness, we’ll talk about one more simple little thing you can do to get closer to that goal. That’s all we have to say about the First Day of Greenness. Look in the mirror, grab a pen and write something down! If you need inspiration, eat a piece of fruit or a vegetable. You are what you eat and that’s a great place to start. . . hope it’s an organic snack! I think I’ve reached the 5 minute limit. . . for those of you who have a few more minutes to spare and want to connect more deeply to our Green history, keep reading! PS: If you’d like an 8 x 10 pdf of the picture of Wormy & Friends (above) – with the black & white circle for coloring- send an email to: ghfamily@atthegreenhouse.com – Just put “1st Day- Coloring page” in the Subject. Thanks! For those of you who are new to At the Green House. . . Welcome! We’re basically a comic strip about a family named The Greens, who wants to be greener. We have Pam & Todd, the main people and a group of “critters” who live in their yard, one of which is a little earthworm named Wormy. He eventually becomes the hero of our planet, literally, in a feature of his own. Our goal in the next year is to develop Wormy, alongside the Greens. . . but in his own weekly feature for children. Before we get too far ahead. . . here’s a bit more about the history of At the Green House (if time permits). About At The Green House . . .
It’s been quite a while since we’ve been active on Facebook or with anything new in The Green House. . . but like all things green, sometimes the first attempt grows and doesn’t find the right conditions to survive. The key is to keep the seeds . . . and when conditions are right, give them some sun, well-composted nutrients and let them grow into something new and (hopefully) ever-lasting. Peter and I have been keeping the Green House seeds dry and warm, tucked into pockets close to our hearts and waiting for the right conditions to plant them again. . . this is that time. Now. 2019 is the year! For the past few months, we’ve been meeting, writing and drawing new material and formulating a “growth chart” for the Green House projects. And now the time has come. . . We are going to share our adventures and stories about the “daily sproutings” and our “process” here with you beginning today! It’s been a little like developing quality compost- mixing a little of this -with a little of that. . . green stuff, brown stuff. . . history, new ideas. . . failings, dreams, renewed hope and energy. . . a little manure. . .
What is At the Green House’s story? It’s a story about finding our passion, believing in it, working hard at it and then keeping the embers glowing after it looked like life, time and circumstance had blown it out. So at the risk of being long-winded here and “messing with our embers,” I’m just letting you all know that the seeds have been planted in the compost and we are returning to the Green House to get things GROWING! Our gratitude goes out to all of you who’ve kept in touch with us, asking, “How’s Wormy doing?” and hoping to see some new foliage. New growth will be popping up here and growing toward YOUR light. We hope you’ll read and contribute your thoughts and comments. We didn’t give up. We were just composting.